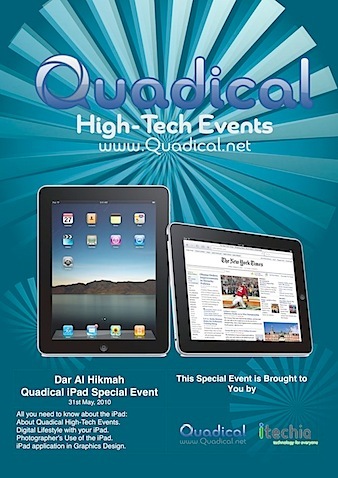 On the 31st of May, 2010 (today) Quadical will present a special iPad event at Dar Al Hikma college, where speakers will cover topics on how to use the iPad as a lifestyle device, as a photographers power tool, and as a graphics designer’s canvas. The event will start at 1p.m. and will end at 2:30 p.m. offering the audience a chance to ask questions and interact with the main speakers. During the event Quadical will offer a 15% discount coupons to buy cool gadgets from itechia, plus a chance to win a Free iPad courtesy of itechia and Quadical. iPad as a Graphic designer’s tablet? i’d like to hear more about that!